I did a speed test with my Quadcopter V1. I was able to reach 78 km/h! It gives a good information about the headwind speed the quadcopter can handle. There was no wind that day. At the maximum speed, we can see that the image is shaky. I think that it’s caused by the wind force applied on the GoPro which makes the gimbal dampers vibrate. These curves show the GPS speed, the battery voltage and the current draw. These data were recorded on the APM board (dataflash logs). The maximum speed (78 km/h) is reached after about 6 seconds acceleration. At the corresponding time, the current draw (31.3 A) is twice bigger than during hovering. 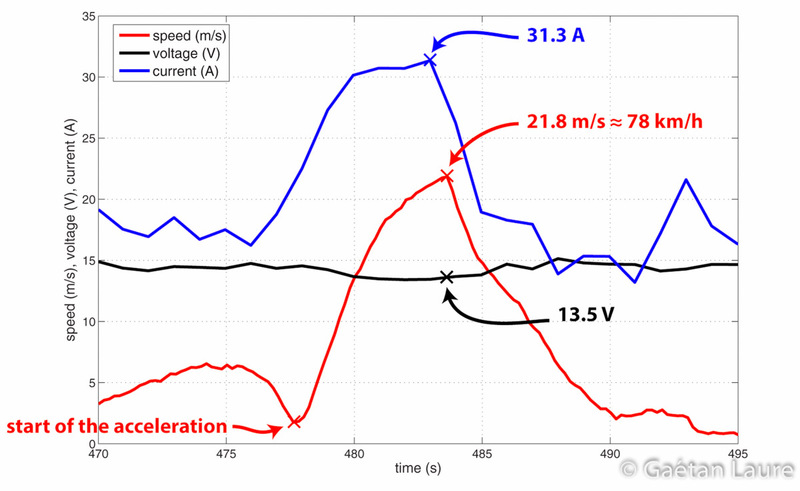 The power draw reaches 31.3 A x 13.5 V ≈ 423 W. On the voltage curve, we can notice a voltage drop. The speed never reached a constant value, it should be possible to go faster with the same propulsion chain (battery/ESCs/motors/props). But the mechanic parts might not handle such a speed.